Connie & Randy Cotita formally formed Studio Abbellire as a full time venture in the mid nineties. After majoring in art in college in the late seventies, they were involved always in the decorative field. 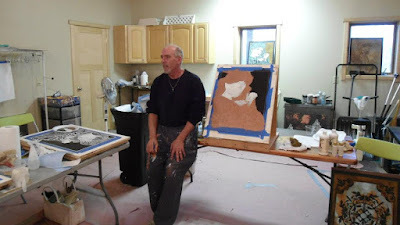 Even as Randy did a decade long stint as a police officer, they worked in the remodeling and decorating of homes, with Connie always having art related projects going. Connie began working with local decorators and designers and immersed herself in the industry, using the opportunities to expand her knowledge & experience. Having worked together in the remodeling/decorating field for years part time, when Randy decided to quit the police department, they opted to go full time and created Studio Abbellire (pronounced ah-buh-leer-a). Abbellire is an Italian word, which means, “to adorn or make beautiful." 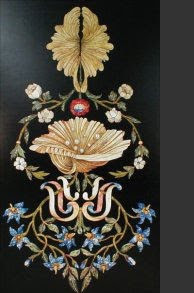 In the late nineties they were commissioned to assist in the decoration of the recent installation in an antebellum style residence, of the reproduction moldings from the palace of Catherine the Great. The moldings were part of a museum display that were a traveling venue of many museums throughout the U.S. The moldings were auctioned off at the end of the tour and local homeowners purchased them. Connie & Randy repaired, gilded, helped add accents and preserve the plasterwork. 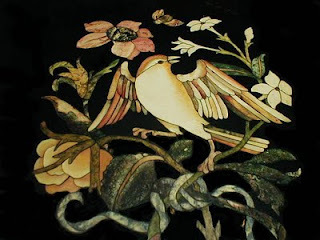 They then proceed to many other portions of the home installing & gilding new applied ornament..
A major inspirational turning point for them occurred in 2002 when they received invitations to the International Decorative Painters Salon hosted by Vigini Studios in San Antonio. While attending, they saw the immense talent and camaraderie of some of the finest of decorative artisans. They desired for others to see and share the plethora of talent and availability of products available to the industry. For that purpose they created a web site call InfauxWorld as a service to all. 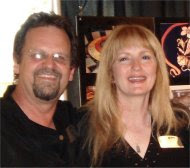 In 2005, Connie and Randy were invited to display their work at the Salon gathering in Philadelphia hosted by Ross O'Neal, and again in the 2006 Salon hosted in the Netherlands by Jan Berghuis and Cornelius Sheer of the Nimeto Art School. This was an amazing venue and opportunity for all artists attending. Many Salon artists, including Connie and Randy had their work selected for display in the M.C. Escher Museum in The Hague for 3 months. In October 2007 the two were selected to particpate in the "Meeting of the Masters," hosted by Faux Effects International in Dallas, TX. Their works have been displayed in Delta Style magazine, The American Painting Contractor, Artistic Stenciler, SB Magazine and the local News Star. October 2008 their work was displayed in "Designer Faux Finishing" a book by Victor DeMasi. The two recently finished and submitted works which will be featured in "It's Faux Easy 2" by Gary Lord, which will be out near the end of 2009. In 2004, Connie reworked 33 pieces of donated furniture by adding decorative finishes. The pieces were auctioned off for a charity called "Night of the Child," which helps fight child abuse. Connie has been a member and certified stencilist through the Stencil Artisans League, Inc. (SALI) since 1998. Currently Connie & Randy are based in Louisiana where they are traveling and working in homes and condos along the gulf coast. They own a home in the northeast where they plan to fully relocate to in the near future.